Axis & Allies is a World War II strategy board game. It has a long version history since its development in 1981 and a still-avid and active following. Axis & Allies is one of those games I heard lots about, saw copies of in hobby/game stores (and sometimes even in commercial stores), and yet was nervous to pick up due to the seemingly sprawling nature of the game and intense time requirement it’s rumored to require. As previously mentioned, Axis & Allies still has an avid fan base, and I didn’t have to look far to find a participation demo where we could learn the game and play it for the first time. Since I was a bit intimated, I didn’t want to purchase the game myself and learn/teach game mechanics as a beginner. My cousin and I attended this year’s annual Field Marshall Gaming Convention (FMG Con) for one day in Oshawa, Ontario. 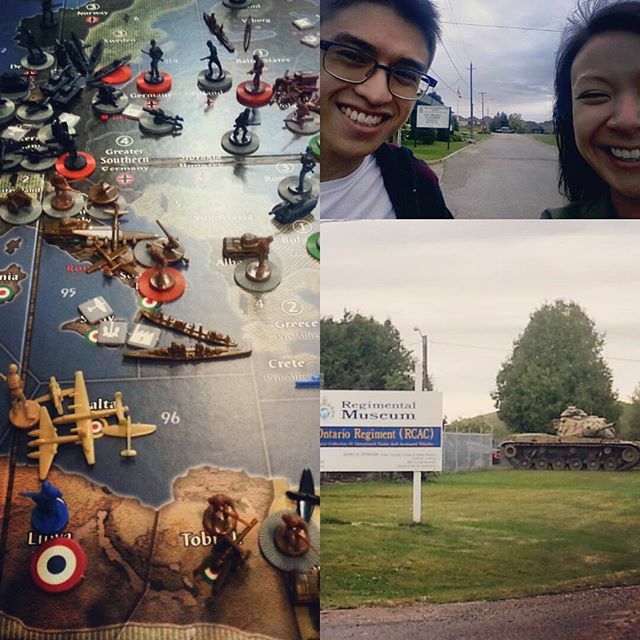 We had no clue what to expect after our adventure to the Amber Diceless RPG convention earlier this year and were surprised to drive out to Oshawa and find ourselves in a military aircraft museum – a fitting environment to learn how to play Axis & Allies for the first time. The building hosting FMG Con itself was quite small, but the feeling of being among people who shared a similar passion for tabletop gaming/pen and paper gaming was more than enough to make the environment a great one. My cousin and I initially signed up for a four-hour participation demo of Axis & Allies Miniatures but, while waiting for our game to start, were invited to join a couple of guys who were interested in playing Axis & Allies: Global 1940. They gamely took us on despite our complete lack of experience and patiently explained game mechanics to us. Again, mechanics are simple, but the scope of playing out World War II was enormous. My cousin and I found ourselves playing for a solid eight-hours – taking a total of four turns before having to call an experienced gamer to assess the game and call the winner since we had to leave. I left feeling the satisfaction of having learned something new, met a few great people in a friendly environment, and finding yet another game that was worth investing in. Though the initial investment to start playing is the cost of the board game (you can find decent boards online for about $150), the major investment is in time and energy – the game is certainly large scale and strategic and is not something you can complete in a couple of hours. I can picture picking up Axis & Allies for myself if I were to find a dedicated group to play with over a series of weeks. In the meantime, if you’re into some serious strategic gaming with historical relevance, I’d recommend Axis & Allies. And if you’re feeling for a friendly environment of table top gaming, I’d recommend visiting FMG Con next year. Posted in Games and tagged Games, reviews.